This is the Sumatra Mandheling brought to you by Mela Coffee Roasting Company. 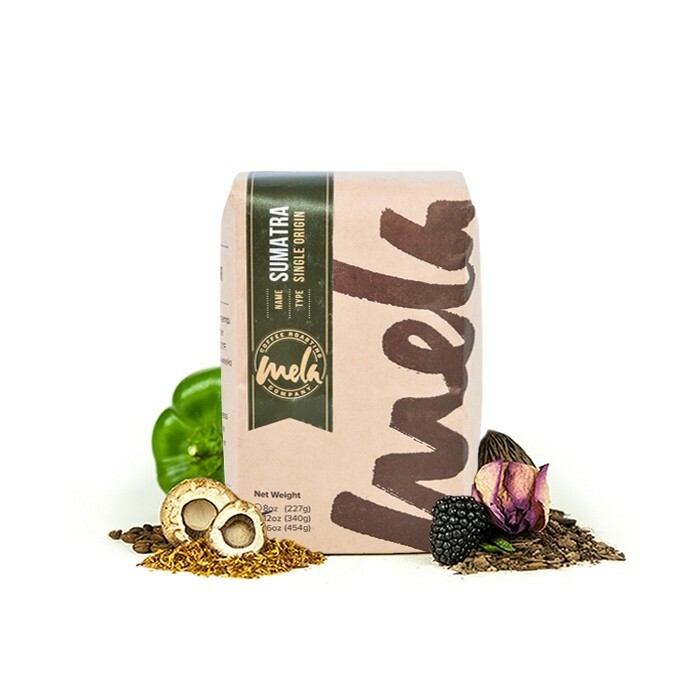 This semi-washed coffee was sourced from the growing region of Mandheling in Sumatra and is Organic certified. The cup has the classic Sumatran profile, with earthy, cocoa, and baking spice notes with a big, full body. Superb. This one ticks all.the boxes for me. A little on the bitter side and never really tasted the notes i typically find in other roasts from Sumatra. Full bodied and I enjoy the spices. A little too earthy for my palette. Smell is beautiful! Nicely earthy but still fairly balanced. While I enjoy this one, I wouldn't mind something a touch more fruity. Definitely do not like Sumatra beans they are very similar to Columbian I am not liking the strong taste similar to a dark roast. Really enjoying this coffee. Yesterday my coffee aroma had notes of leather (in the good way). The flavors I picked up was some sort if spice trying to narrow it down. Really enjoying this one it brings back memories of when I first started drinking coffee 10 years ago Sumatra was one of our go to coffees with my roommates. This was another bold and dark roast coffee that had a smoother finish compared to the Sumatra Gayo River beans. I very much enjoyed this coffee. Solid consistency, but it's SO dark - and I like dark coffee. I'd also say that there's not much flavor depth. It tastes a little burnt. This is an excellent espresso. Very rich and full and very well balanced. Perfect for a cortado or machiatto, but also wonderful as a straight espresso as well. It tasted like a very dark roast which is not my preferred style. It also seemed very one dimensional to me, not a lot of layers to the flavor lie with lighter roasts. There's nothing novel about this coffee but it performs well as just a great, classic cup of coffee. Being fairly regular and balanced also makes it nice for periodically adding other flavours to the coffee like cardamom and cinnamon. Absolutely a delight! Loved the full bodiedness but still kept it subtle where it needs to be. A new favorite. every month the selection gets better and better. thank you! Meh. Strong without much flavor. This is my favorite, please keep coffee like this coming. I do NOT like the dark roast. The last 2 or 3 I did NOT like at all.